The name, hammock, is derived from the Spanish word hamaca. Wise old sailors still prefer to sleep in hammocks, even onshore, because they get a good night's (or day's) rest. 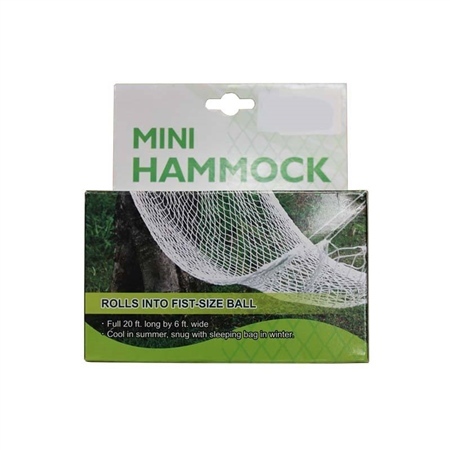 This frameless mini-hammock, woven from tough nylon, rolls up into a fist-size ball and slips easily into a pocket. It is equally useful for boating or camping. Suitable for persons up to 6 ft 3" tall. Full 20 ft. long by 6 ft. wide. Cool in summer, snug with a sleeping bag in winter.